Step down to the level stone flagged area on the waterfront backed with a stone retaining wall. 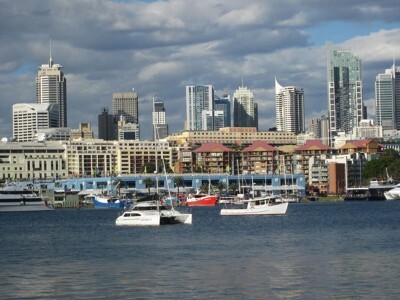 This is the earliest part of Blackwattle Bay Park and has magnificent view of the city skyline. Step down to the level stone flagged area on the waterfront backed with a stone retaining wall. This is the earliest part of Blackwattle Bay Park and has magnificent views of the city skyline. Pyrmont Point, behind the pylon of the Anzac Bridge, is dominated by the old Colonial Sugar Refinery distillery site, now mostly covered by highrise apartments. Near the approaches to the Anzac Bridge the Meriton apartments sit on the stone foundations of the incinerator designed for the City by Walter Burley Griffin. While this large incinerator was demolished in 1992, you will very shortly see the other incinerator on the Bay by this distinguished architect. Behind Pyrmont is the CBD ridge running along George Street. From left to right you can see: the top of the Renzo Piano building (with sloping glass roof) in Macquarie Street; the octagonal MLC tower in Martin Place; Sydney Tower at Market Street; the World Square Tower at Liverpool Street; the Market tower over Paddy’s Market; and the University of Technology tower in Broadway. The walk from here to the bottom of Cook Street has terraces (known as swales) planted with rushes and retaining walls for stormwater (interpretative sign). From this point the ground becomes flat, indicating extensive cut and fill of the foreshore occupied until the 1980s by the hanger-like factories and warehouses used for the storage and repair of shipping containers. This industry, like much on the bays, went through a long period of decline and was gradually replaced, first by the Watermark apartments and then by the redevelopment of the John Fletcher site by Australand in the early years of the current century. Fortunately some of it occupied Crown land and some was owned by Council, so more than one third could be resumed as parkland, contiguous with Blackwattle Bay Park.